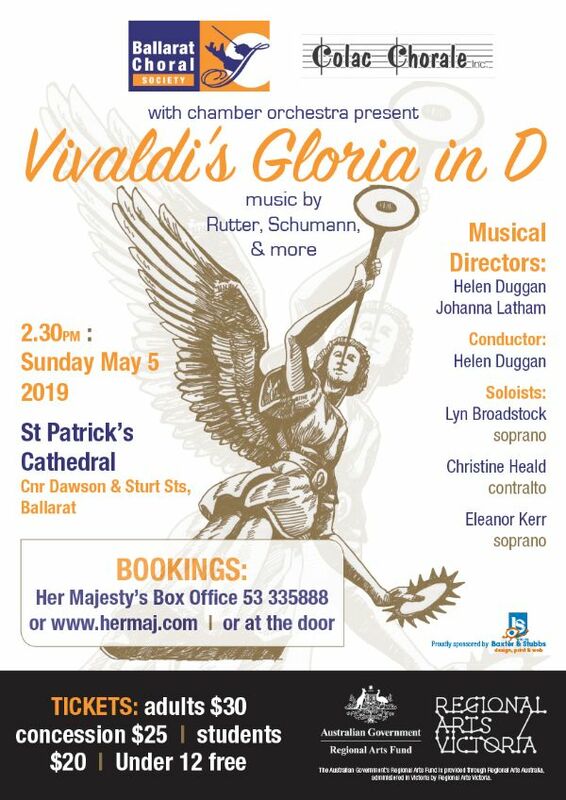 This concert will be presented in Colac, at St Mary’s Catholic Church, 3 Gellibrand St, on Saturday May 4th, and on Sunday 5th May in Ballarat, at St Patrick’s Cathedral. Geelong music lovers were treated to some outstanding choral singing at Capella St. Crucis’s concert of Easter music, titled Media Vita (in the midst of our lives), in the beautiful acoustics of St Marys Basilica. The choir of around 50 musicians performed music by Johann Christoph Altnickol, Bach, Mendelssohn, Max Reger, and James MacMillan. From the opening note, it was clear that this concert was something very special indeed. Befiehl de deine Wege is the opening line of a hymn by Paul Gerhardt, commonly known in English as the hymn O Sacred Head, and used by Bach as the linking chorale in his St Matthew Passion. In Altnickol’s setting the first an last stanza are set as chorales with verses II to XI a set of challenging variations, both for full choir, and various solo ensembles. 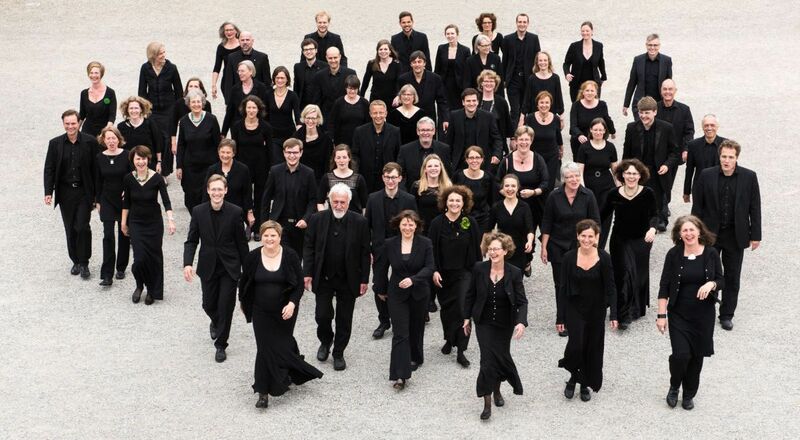 Capella Crucis, and its many accomplished soloists worked together as a precision music-making unit, sensitively conducted by Florian Lohmann. Bach’s Komm, Jesu, komm, a motet for double choir, followed, retaining the mood of solemnity. The only one of Bach’s motets not to feature a biblical text, Komm Jesu Komm is thought to have been composed as a funeral motet. For Mitten wir im Leben sind by Mendelsohn demands male and female choruses, and full 8-part chorus in counterpoint. Here, the dynamic scope of Capella Crucis came to the fore with a full range of dynamics from pianissimo to a rich fortissimo. With Max Reger’s bleak motet, O Tod, wie bitter bist Du the program moved into the 20th century. The text contrasts the bitterness fear that death holds for the prosperous, with the welcome death gives to the old, weak, fearful and needy. The music moves from clashing harmonies and unison solo lines and full choir to rich warm harmonies, finishing on a sustained triple pianissimo. This was a moving performance. The program concluded with a beautiful setting of Miserere by James MacMillan. After enthusiastic applause, Capella Crucis presented an encore – Weep by Australian contemporary composer Joseph Twist. This choir has an extraordinary depth of talent. For this performance, there were at least 13 different soloists, and one had the feeling that many others could step into this role at need. The Geelong concert was presented by Music at the Basilica. Geelong was lucky to have been one of only six Australian towns to hear this wonderful ensemble. Capella St. Crucis from Hannover are on a whirlwind tour of Australia, presenting concerts at McLaren Vale, Adelaide (with Adelaide Philharmonia Chorus), Port Fairy, Geelong, Melbourne (with the Australian Chamber Choir), culminating in a concert at the Sydney Opera House with the Sydney Philharmonia Chorus on April 20th. I was lucky enough to hear Capella St. Crucis again at their concert in Melbourne, which featured, as well as some of the above works, a performance of Charles-Marie Widor’s Messe Solennelle Opus 36 for two choirs and two organs. Capella St. Crucis were joined for this by the Australian Chamber Choir and the Choir of Scots Church. You can hear some of the sound from this concert here. The Warrnambool Organ Festival is seeking choristers for its upcoming choral project, a highlight of the 2019 Warrnambool Organ Festival. 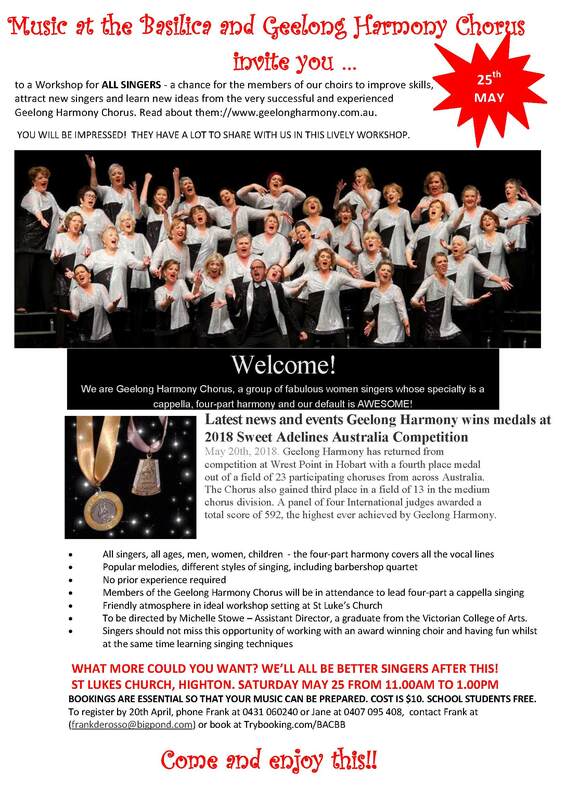 We have choristers from Warrnambool, Hamilton and Port Fairy currently in the choir, and we are hoping that more people throughout the region would like to get involved. We are performing two fantastic sacred choral works this year – Dvorak’s Mass in D and Bruckner’s Te Deum, accompanied by organist Craig Doherty and conducted by Patrick Burns. Patrick, who works in a fellowship position conducting the Australian Ballet, will be running several rehearsals and ‘choral boot camps’ in preparation for the performance- a fantastic opportunity for skills development for local singers and of fun! The choir will also be collaborating with four fantastic operatic soloists for the performance- soprano Louise Keast, alto Sally-Anne Russell, tenor Douglas Kelly and baritone Michael Lampard. Warrnambool Organ Festival performance Saturday 24 August. 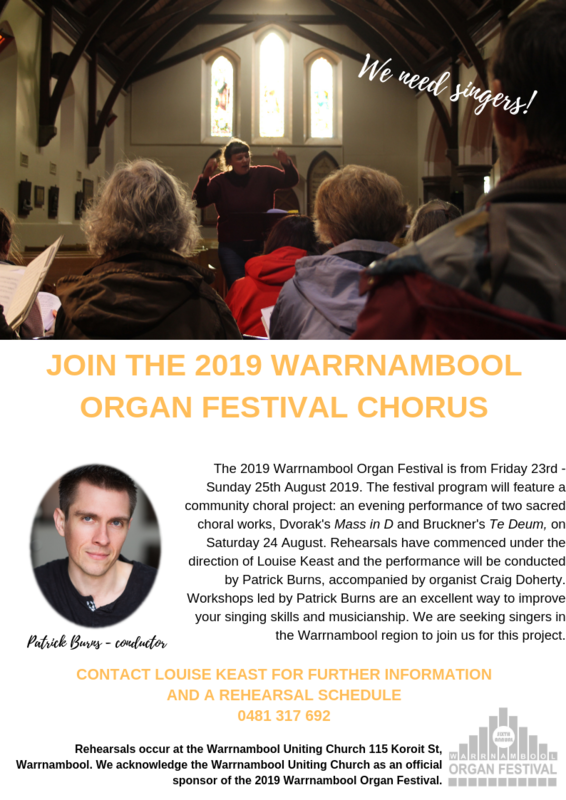 Enquiries and rehearsal schedule/information contact Louise Keast (Warrnambool organ Festival Director) on 0481 317 692. You will participate in performances on the 3th of May for M~M 2019 @ Geelong After Dark. Singers will be invited to perform in two or more of the following times on May 3rd, following a massed choir warmup rehearsal at 6pm. Contact Esther Konings-Oakes to register. There are two songs which can be downloaded below. Sunday the 28th April 3pm-5pm Johnstone Park Gheringhap St.
Header photo from Geelong After Dark website. 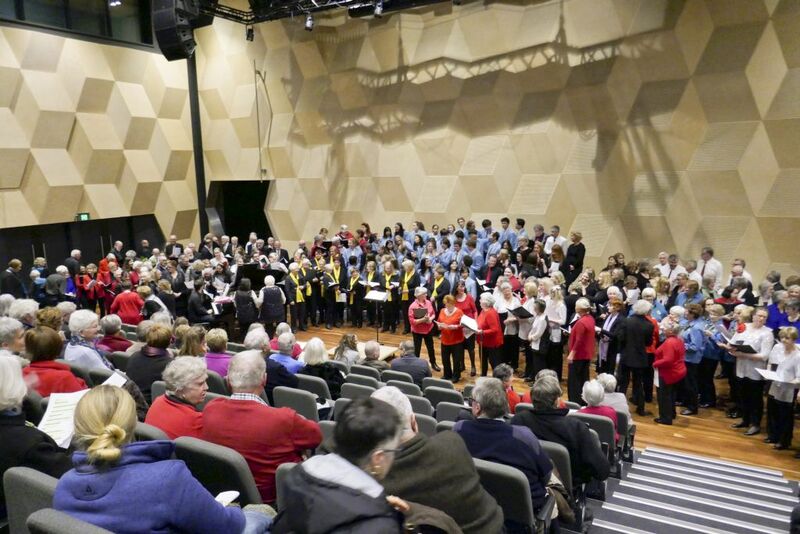 This year’s Western District Choral Festival will be in Warrnambool, hosted by the Merri Singers. All choirs in the Western District of Victoria and South Eastern South Australia are invited to attend. Thanks to Philip Shaw for the details below. The church will be available from 12pm and the concert will start at 1:30pm. There will be an upright piano as well as a small amp with three inputs available for use by choirs. The amp will be used for announcements and the guitar accompaniment of one of the group songs. Tea, coffee and toilet facilities will be available in the meeting space next to the church, but afternoon tea following the singing will be in the church hall. St Joseph’s is wheelchair accessible from the car park, as is the church hall. We expect each group to have 8 minutes of performance time. Please let us know if you have any special requirements (eg mobility problems for moving into position). 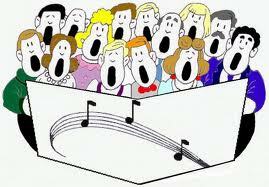 To make the afternoon manageable we will be able to host a maximum of 15 choirs at the festival. More than this would necessitate having the afternoon too long or brackets too short. Choirs that have already expressed interest will have first options of attending, after which acceptance will be in order of Registration receipt. Group songs will be a traditional Zulu hymn Thuma Mina and Everything Can Turn Around, a song written for a men’s health flash mob by Warrnambool songwriter Don Cowling. Electronic copies of these will be circulated on acceptance of Registration. Post-festival tea is traditionally the time that the host of the following year’s WDCF is announced, so now is a good time to start thinking about throwing your hat into the ring. Please let us know if you are interested. Previous hosts are always willing to share hints to make the yoke easier and the burthen lighter! Please download and complete the registration form attached (either directly in the Word Document or by printing the PDF document and completing manually) and return it to Philip Shaw or as text attachment to 0437 955 887 by Friday 12 April. Once again, all singers are invited to participate in the 2019 season of Singing the Classics. The first work for you to sing is Carmina Burana by Carl Orff, on Sunday, April 7th, at St Luke’s Church Highton, from 2-5pm. The conductor for this performance is Tom Healey, with Anne Pilgrim accompanist. Singing the Classics gives singers the chance to sing works which may be beyond the scope of their regular choirs, and is a chance for singers to enjoy each other’s company as they make music. Carmina Burana is an exciting work and great fun to sing.